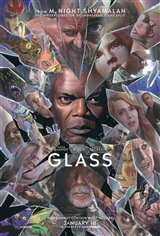 Not highly exciting, but if you watched Split and Unbreakable, I guess you owe it to yourself to sit through it. Oscar - worthy? Movie - no, though I liked it and consider it a worthy conclusion (?) to this trio of films. But James MacAvoy? Yes, yes, yes! Here's hoping the academy remembers him next year. Chris Stuckman refers to this movie in his review as the antithesis of Marvel movies. I agree, and that's not a bad thing. I'll be curious about what MNS comes up with next. Not driven - but curious. Saw a lot of M. Night Shysterman movies before and all but one were garbage... eg. The Happening...a horror movie about wind. Really? So reading most of these reviews, I'm really happy l didn't waste $$ and more importantly time on what most reviews are saying is crap. Shysterman… remember the name and stay away. ZZZZZZZZZZZZ....wake up catch the fighting scene at the end. A NETFLIX movie at best if you plan to doze off and sleep. Who is the MORON that thinks this is the best Oscar movie ever made? I bet you is some one that has no taste or is doped up or drunk or just ignorant as what makes a good movie. Oscar worthy- Best 2019 movie so far. Must see. A new high for the series. What a waste of time and money lost just for an awful movie! At least l got a free popcorn!!!!! This was the most boring movie l ever saw. Rated it just because of a couple of good actors in it, supposedly. Walked out almost half way thru it!!!! Slow paced as a turtle and a terrible finale. This movie should never have been made. I would rather watch a garbage can open and close eating this movie and going num num num. LOL. That is how bad this movie is. An exciting nail biting film. Excellent acting by McAvoy and Jackson. When I read a review like the below which praises and recommends a Marvel Comics film like " Aqua Man" instead of this I immediately know that the review is unreliable and probably written by a young, if not dim-witted person who really doesn't understand how to create real suspense without loud noises and special effects. Go see this film. It is worth your time. I can’t believe some people enjoyed this trash. It was so garbage and that is all it will ever be. Don’t listen to the people that enjoyed this movie they are one of the few. Most of us hated this film because it was incredibly slow and not your type of thriller or action movie. This movie has a terrible ending and one that drags on and on until you finally see the credits and say ‘finally it is over but then it isn’t and you wait a bit longer and after a few times thinking it is over it finally ends. Save your time and watch something else. Looks like you love it or hate it. I loved it. Not predictable for me. James McaAvoy does a fabulous job with all of his personalities. It will be a definite "watch again" for me when it is out on DVD or cable. Slow pace movie .....the fight at the end was the best part of the movie. Who is the MORON that said "best action movie" really???? Guess he must have lived in a cave to think so .... More of a one time flick and forget about it. James McAvoy truly extrodinary performaces. Not so great. I regret seeing it. Too slow, boring, long. When this director is going to stop making movies? This movie was so lame and stupid. The only good part was the trailer. The perfect tie-in for the previous films, and a great lead-in to future films (?). A twisted ending as any of this director’s movie style. Which make you feel you need your money back. A none a great good movie. Another movie from S.... Boring!!!! Same style different actors. Same type of stories.